Hood Canarygrass (Phalaris paradoxa) is a monocot weed in the Poaceae family. In Mexico this weed first evolved resistance to Group A/1 herbicides in 1996 and infests Wheat. Group A/1 herbicides are known as ACCase inhibitors (Inhibition of acetyl CoA carboxylase (ACCase)). Research has shown that these particular biotypes are resistant to clodinafop-propargyl, fenoxaprop-P-ethyl, pinoxaden, and tralkoxydim and they may be cross-resistant to other Group A/1 herbicides. Field, Greenhouse, and Laboratory trials comparing a known susceptible Hood Canarygrass biotype with this Hood Canarygrass biotype have been used to confirm resistance. For further information on the tests conducted please contact the local weed scientists that provided this information. There is no record of differences in fitness or competitiveness of these resistant biotypes when compared to that of normal susceptible biotypes. If you have any information pertaining to the fitness of Group A/1 resistant Hood Canarygrass from Mexico please update the database. Mail Code:7505P, 1200 Pennsylvania Avenue, N. W.
The Herbicide Resistance Action Committee, The Weed Science Society of America, and weed scientists in Mexico have been instrumental in providing you this information. Particular thanks is given to Ken Sayre, and J. Antonio Tafoya-Razo for providing detailed information. Cruz-Hipolito, H. ; Domínguez-Valenzuela, J. A. ; Osuna, M. D. ; Prado, R. de. 2012. Resistance mechanism to acetyl coenzyme A carboxylase inhibiting herbicides in Phalaris paradoxa collected in Mexican wheat fields. Plant and Soil 355 : 121 - 130. Background and aims: In this study, we describe the molecular, physiological and agronomic aspects involved in the resistance to acetyl coenzyme A carboxylase inhibiting herbicides (ACCase) observed in one biotype of Phalaris paradoxa from Mexico. Methods: Dose-response Assays: The herbicide rate inhibiting plant growth of each biotype by 50% with respect to the untreated control, ED50. Enzyme purification and ACCase assays to determine herbicide rate inhibiting the enzyme of each biotype by 50% with respect to the untreated control, I50. Absorption and Translocation Assays with [14C]diclofop-methyl. Metabolism of diclofop-methyl and its metabolites were identified by thin-layer chromatography. Study of target site resistance mechanism at enzyme and molecular levels. Results: In this work, it has been studied the whole-plant response of Phalaris paradoxa biotypes from Mexico resistant (R) and susceptible (S) to ACCase-inhibiting herbicides: aryloxyphenoxypropionate (APP), cyclohexanedione (CHD) and phenylpyrazoline (PPZ), and the mechanism behind their resistance were studied. To analyse the resistance mechanism, the enzyme ACCase activity was investigated. Results from biochemical assays indicated a target-site resistance as the cause of reduced susceptibility to ACCase inhibitors. The absorption, translocation and metabolism were similar between R and S biotypes. A point mutation never described before was detected within the triplet of glycine at the amino acid position 2096 (referring to EMBL accession no. AJ310767) and resulted in the triplet of serine. This new mutation could explain the loss of affinity for the ACCase-inhibiting herbicides. Conclusions: We found a new mutation, which had never been described before. This mutation was detected within the triplet of glycine at the amino acid position 2096. This new mutation confers cross-resistance to three different chemical groups of ACCase-inhibiting herbicides..
Collavo, A. ; Panozzo, S. ; Lucchesi, G. ; Scarabel, L. ; Sattin, M.. 2011. Characterisation and management of Phalaris paradoxa resistant to ACCase-inhibitors. Crop Protection 30 : 293 - 299. Phalaris paradoxa is a competitive grass commonly found in durum wheat crops of central and southern Italy. Among the 85 populations screened from 1998 to 2008 for resistance to ACCase-inhibitors and graminicide sulfonylureas, 17 resulted as being resistant to at least one ACCase inhibitor while none of the populations showed resistance to sulfonylureas. ACCase resistance in hood canary-grass seems to be spreading rather slowly in Italy. Out of the 17 populations, seven were characterised through outdoor dose-response pot experiments to investigate resistance levels and cross-resistance patterns to ACCase-inhibitors and multiple resistance to other mode of action. Molecular bases of resistance to the recently introduced DEN herbicide pinoxaden were also investigated. Six populations were confirmed to be ACCase-resistant with various cross-resistance patterns. Two populations were resistant to all tested ACCase herbicides, with pinoxaden resistance indexes (RI) based on survival ranging from 22 to 50. The two populations have been molecularly characterised for resistance to pinoxaden. A single point-mutation in the ACCase gene was identified in each population, causing the amino-acid substitutions of Ile1781Val and Asp2078Gly in 0478L and 0025, respectively. The results suggest that resistance of P. paradoxa to pinoxaden is due to an altered target site and different mutations cause different resistance levels. The biological characteristics of the species, mainly self-pollinated, and the absence of multiple resistance allow herbicides with different modes of action to be used for controlling ACCase-resistant populations. Chemical tools should be carefully used within integrated weed management strategies..
O Hochberg, M Sibony, and B Rubin. 2009. The response of ACCase-resistant Phalaris paradoxa populations involves two different target site mutations. Weed Research 49 : 37. Phalaris paradoxa (awned canary-grass) is an aggressive annual winter weed in wheat and other arable crops that is controlled mainly by ACCase-inhibiting herbicides: cyclohexanediones (DIMs), aryloxyphenoxypropionates (FOPs) and phenylpyrazolines (DENs, e.g. pinoxaden). The selection pressure imposed on the weed populations by repeated use of these herbicides has resulted in the evolution of increased numbers of ACCase-resistant populations of P. paradoxa in Israel and other countries. Two populations, Revadim (RV) and Mishmar Ha’emek (MH) that were exposed to differing weed and crop management tactics were investigated. Both populations were highly resistant to all FOPs, pinoxaden and cycloxydim, but responded differently to some DIMs. RV plants exhibited much higher resistance to tralkoxydim than MH plants, while showing similar low levels of resistance to tepraloxydim and clethodim. Both populations were equally susceptible to graminicides with other modes of action. The mutations responsible for the observed resistance were identified using PCR-RFLP and by sequencing the carboxyl transferase domain of the chloroplastic ACCase gene. RV plants possess a substitution of Asp2078 to Gly, whereas in MH population a mixture of Ile2041 to Asn or Asp2078 to Gly was found. Our study demonstrates that lack of herbicide and crop rotation may result in the evolution of diverse target site mutations and differential response of the whole plant to ACCase inhibitors..
Gherekhloo, J. ; Zand, E. ; Gonzáles-Torralva, F. ; Prado, R. de. 2009. Herbicide-resistant weeds in Iran: a short review. : 376 - 380. More than 70% of arable land in Iran is given over to cultivation of wheat, barley and rice which are major crops in the country, while wheat alone covers nearly 52%. During last four decades, 86 herbicides belonging to different families such as synthetic auxins, triazines, phenylureas, aryloxyphenoxypropanoates (APP), cyclohexadiones (CHD), sulphonylureas, imidazolinones, and glycines have been registered in Iran, 24 of which are for selective control of weeds in wheat and barley. 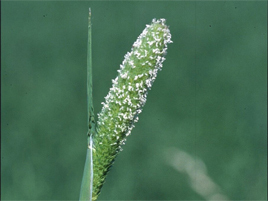 Consecutive use of acetyl Coenzyme A carboxylase (ACCase) inhibiting herbicides for control grasses which are troublesome weeds in wheat in Iran, has resulted in resistance of some grass species to ACCase inhibitors in some parts of the country. To date, resistance of Avena ludoviciana, A. fatua, Phalaris minor, P. paradoxa, Lolium rigidum to APP herbicides has been reported. To date there is no document about the appearance of resistant weeds in fields of other crops in Iran..